100 Dancing Drones Set World Record. Click on that phrase to find a YouTube video showing Intel breaking the Guiness Book of Records. 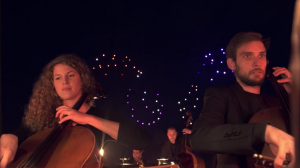 They created a swarm of drones that could dance to Beethoven’s Fifth, spell out “Intel” and otherwise astonish us. The military possibilities struck us immediately. And no, we’re not kidding.